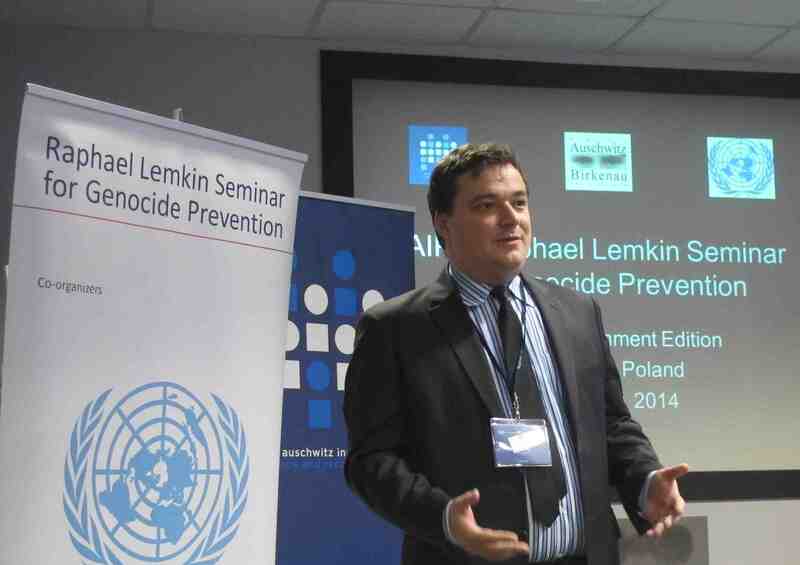 The Global Edition of the Lemkin Seminar, organized in partnership with the Auschwitz – Birkenau State Museum and the United Nation’s Joint Office of the Special Advisers on the Prevention of Genocide and the Responsibility to Protect, brings mid-level government officials from countries around the world to the site of the former German Nazi Concentration and Extermination Camp Auschwitz-Birkenau in Oswiecim, Poland, for one week of education in preventing genocide. To introduce participants to the concepts of genocide and other atrocity crimes, and the processes by which genocide occurs. To empower participants with the practical competencies (foundational knowledge and skills) necessary to prevent genocide from ever taking place, prevent further atrocities once genocide has begun, and prevent future atrocities once a society has begun to rebuild after genocide. To develop a worldwide network of state officials who will take action to prevent genocide and other atrocity crimes. For AIPR alumni to have space to share the work they have done – both the successes and failures – in efforts of prevention, including national, regional, and international cooperative mechanisms. For AIPR alumni to extend and continue the learning from their inaugural seminars in Poland with a particular focus on upstream prevention and the historical and contemporary role of forced concentrations in the persecution and destruction of civilian populations. To empower participants with the practical competencies (knowledge and skills) necessary to develop the means to identify and deter the potential for genocide, limit genocide as it unfolds, and engage in the best practices of post-conflict peacebuilding that aim to prevent the future occurrence of mass atrocity in a postconflict society. To reinforce the international security and human rights norm of the responsibility to protect, with clear recognition of the idea that sovereignty is not a privilege, but a responsibility. To strengthen capacity-building by creating a worldwide communication network of genocide-sensitive policymakers, shapers of political will, who will become agents of genocide and atrocity crimes prevention with a heightened degree of awareness and sensitivity to the role of non-governmental actors in supporting their work in zones of conflict. To empower participants with the practical competencies (knowledge and skills) necessary to develop the means to identify and deter the potential for genocide, limit genocide as it unfolds, and engage in the best practices of post-conflict peacebuilding that aim to prevent the future occurrence of mass atrocity in a post-conflict society. To strengthen capacity-building by creating a worldwide communication network of genocide-sensitive policymakers, shapers of political will, who will become agents of genocide and mass atrocity prevention with a heightened degree of awareness and sensitivity to the role of non-governmental actors in supporting their work in zones of conflict. To provide all former participants of the Global Raphael Lemkin Seminar Series with a forum in which to explore ways to strengthen their roles in their respective sectors of government to advance preventative action. To identify new policy tools to be applied in their work at the national level in the field of genocide and mass atrocity prevention. To identify common concrete elements of prevention and protection strategies in addition to challenges faced at the national and regional level. Mechanisms to be developed to monitor and strengthen the impact at the national and regional levels. To inform participants about the creation of the “Global Action Against Mass Atrocity Crimes (GAAMAC),” an international cooperation network under which the prevention of genocide and the Responsibility to Protect networks would cooperate to prevent the four crimes (war crimes, crimes against humanity, genocide and ethnic cleansing). A direct outcome the High-Level Working Meeting on the Prevention of Atrocities (PA) coorganized by the Tanzanian Ministry for Foreign Affairs and International Cooperation and the Swiss Ministry of Foreign Affairs, took place in Dar es Salaam, from March 18-20, 2013. Making the existence of a joint sub-working group, operating under the umbrella of GAAMAC, tasked with the mandate of paving the way for the first GAAMAC international meeting of Focal Points in 2014. To strengthen capacity-building by creating a worldwide communication network of genocide-sensitive policymakers, shapers of political will, who will become agents of genocide and mass atrocity prevention with a heightened degree of awareness and sensitivity to the role of nongovernmental actors in supporting their work in zones of conflict. To empower participants with the practical competencies (knowledge and skills) necessary to develop the means to identify and deter the potential for genocide, limit genocide as it unfolds, and engage in programs of transitional justice that aim to prevent the future occurrence of mass atrocity in a post-conflict society. To create a worldwide communication network of genocide-sensitive policymakers, with a heightened degree of awareness and sensitivity to the role of nongovernmental actors in supporting their work in zones of conflict. To form a working group team that will follow up and remain in contact.